For years Rentech has wasted shareholder capital by chasing the alternative energy dream, the company has never turned a profit in 30+ years of existence. In 2014, Rentech's board finally threw in the towel, fired the CEO, hired an MLP veteran, sold the last of the alternative energy business, and shifted focus to their agricultural commodity/fertilizer business Rentech Nitrogen Partners (RNF) which they own 60% of the MLP's units, and their wood fibre business which produces wood chips and pellets for both industrial and energy market use. I'll be the first to admit that I know little about the nitrogen fertilizer or wood fibre businesses, but the sentiment is severely depressed around Rentech, despite most of the capital spend being completed in the wood fibre business and a new CEO with a wide range of experiences centered around the MLP space in Keith Forman. Using current market prices for RNF, the market is assigning very little value to the wood fibre businesses which have been marred by delays and cost overruns, but are still on target to produce significant cash flow by year end with the ultimate goal to float the business as it's own MLP. Additionally on 2/17/15, Rentech announced they were pursuing strategic alternatives of their primary asset RNF, all options are on the table, either in whole or one of the two fertilizer facilities in East Dubuque, IL and Pasadena, TX, both of which struggled in 2014 with site specific issues and industry headwinds. Fulghum Fibres: Rentech entered the wood fibre market in 2013 with the purchase of Fulghum Fibres which produces wood chips for the pulp, paper, and packaging industry. Fulghum operates 31 mills each typically under long term contracts with a major market participant, with the customer being responsible for supplying the wood product and Fulghum is paid a processing fee for running the mill. Fulghum has a strong 70% market position in the United States (also has operations in South America) but struggled in 2014 due to a fire at one of their mills and some resulting costs. It's projected to do $17MM in EBITDA in 2015, down from the originally guided $20MM annually at the time of the acquisition. New England Wood Pellet (NEWP): Rentech acquired NEWP on 5/1/14, NEWP operates four wood pellet processing facilities in the northeast for commercial and residential heating applications (so it's a pretty seasonal business). They primarily sell through big box retailers like Home Depot and Lowe's but also will sell directly to entities like governments, schools, etc. NEWP has been performing above expectations (perhaps the only RTK unit that can say that) and is expected to earn $9MM in EBITDA in 2015. Wood Pellets - Industrial: Rentech's expensive boondoggle has been the repurposing of two plants in Ontario, Canada that when operational will produce and sell wood pellets for use by two large Canadian power utilities (Drax and OPG). The Wawa plant (the larger of the two) was a former strand board mill and the Atikokan plant a former partical board processing mill, both are significantly behind schedule and over budget (although Atikokan is essentially completed and in the commissioning phase). These two projects are where much of the negative investor sentiment lies, as incremental progress is made and revised timelines are met, Rentech has the opportunity to regain the market's trust. The segment isn't expected to be cash flow or EBITDA positive in 2015, but in 2016 new management is sticking to the $15MM EBITDA estimate. All of these business segments are qualified assets for an MLP which remains the primary goal of management and would force the market to revalue the stub via the MLP tax arbitrage game. There doesn't appear to be a good comparable in the MLP market (please alert me if you know of one), so below I just took a swag at determining a multiple for each piece of the stub that's hopefully reasonable and conservative. Given Rentech's failure in the past several decades to generate taxable income, they also have $177MM in NOLs to help shield any windfall in selling RNF, but expect some tax leakage. The real key is new management, Keith Forman is a relative outsider to Rentech (he was previously a board member), he brings a fresh perspective without emotional attachment to any legacy business or asset. Plus he has wide ranging experience throughout the MLP value chain; as a lender to many early MLPs, senior management roles, and leading a trade association group. With him leading Rentech it's more likely than not the wood fibre businesses gets IPO'd within the next 12-18 months and the market will start to recognize that event sometime sooner. Risks include continued poor execution in the wood fibre businesses, RNF not being sold (although it's trading below where it was when strategic alternatives were announced, and well below 2012-2013 levels), and GSO/Blackstone (debt, convertible preferred holder) taking a bigger bite out of the upside. I started a small position this week. Gramercy Property Trust (GPT, f/k/a Gramercy Capital) is a well known company to many value investors, it was a busted commercial mortgage REIT that was essentially in runoff mode and traded near cash ex-non recourse debt that was obscuring the value. In came former W.P. Carey CEO Gordon DuGan and his lieutenants in the middle of 2012 to reshape the company as an office and industrial triple net lease equity REIT. I covered it often in 2012-2013, since then it's continued on its path of raising capital, deploying it primarily into class B net lease properties, and creating additional value by utilizing the inherent operating leverage of spreading their expenses over a larger asset base. It's morphed into your typical equity REIT now with a $2.3B enterprise value, why am I still holding it? First, I have great respect for management and they're 2/3rds of the way through their incentive agreement that will pay the top 3 guys $20MM if they can hit $7 in 2015 (already there) and $9 in 2016. Second, they've made a recent move into asset management (an area of interest for me in 2015) through the creation of Gramercy Europe which should effectively create additional leverage from external management and incentive fees. In past investor presentations the company has teased the idea of expanding into Europe as Gordon DuGan has had previous experience with that market through W.P. Carey (started up the business in 1998 for WPC). The question from analysts had always been why? Gramercy is a relatively small REIT, there should be plenty of runway here in the United States for the company to grow. In December, the company announced the formation of Gramercy Europe Property Fund, a €350MM joint venture, through the purchase of ThreadGreen Europe (renamed Gramercy Europe Asset Management) which is also run by some former W.P. Carey executives and currently manages €146MM worth of net lease industrial and office properties. Gramercy expects to list the company within 18 months as a separately traded entity that will be externally managed by Gramercy (think North Star's recent announcement of a European spinoff). The European market looks attractive, many corporations still hold operating real estate on their balance sheets, there's less competition, and cheap interest rates. Other players like North Star, Blackrock, and Colony Financial have been making opportunistic pushes into Europe as well. Gramercy is going to keep its focus on class B assets in Europe as they do in the U.S., a pretty overlooked and boring market, but one with the capability of generating predictable solid returns. They haven't publicly disclosed what the management fees will be, but Gordon DuGan slightly slipped up on the conference call this morning mentioning a 1% base fee before retracting and stating market rates. While unlikely to be a meaningful driver in 2015, the combination of ROI on their €50MM investment plus the added bonus of management and incentive fees should help Gramercy reach that $9 management incentive payout target by middle 2016 (25-30% return in 18 months). 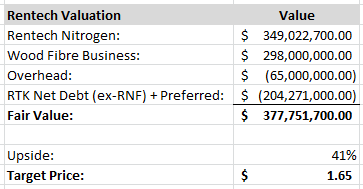 Gramercy is a pretty simple business to value currently, management has projected a $0.45-$0.50 FFO for the year, putting a 15 multiple on that gets you a $6.75-7.50 range of reasonable value, right where its trading at currently. Using that same math, Gramercy needs a $0.60 FFO run rate to get to $9 share price, let's say $0.05 of the needed $0.10 comes from continuing to play the private/public market arbitrage game and adding to their U.S. net lease portfolio. If the European fund can do $9.5MM in asset management fees annually it can add another $0.05 to FFO without issuing additional shares. Assuming some incentive fees and some expansion to the €350MM initial target, the fund probably needs to double before it lists, the $9 target shouldn't be too much a stretch. My only disappointment, and its minor at that, is the CDOs. Gramercy still holds the equity and some junior pieces in their three legacy CRE CDO transactions they sponsored as GKK from 2005-2007. As they continue to issue additional equity, the optionality of those legacy CDO positions gets smaller and smaller to the point now they're just a drop in the bucket on a per share basis. It would have been interesting to have seen them spinoff the CDOs or have created some kind of CVR when they switched strategies and isolated the CDO value. 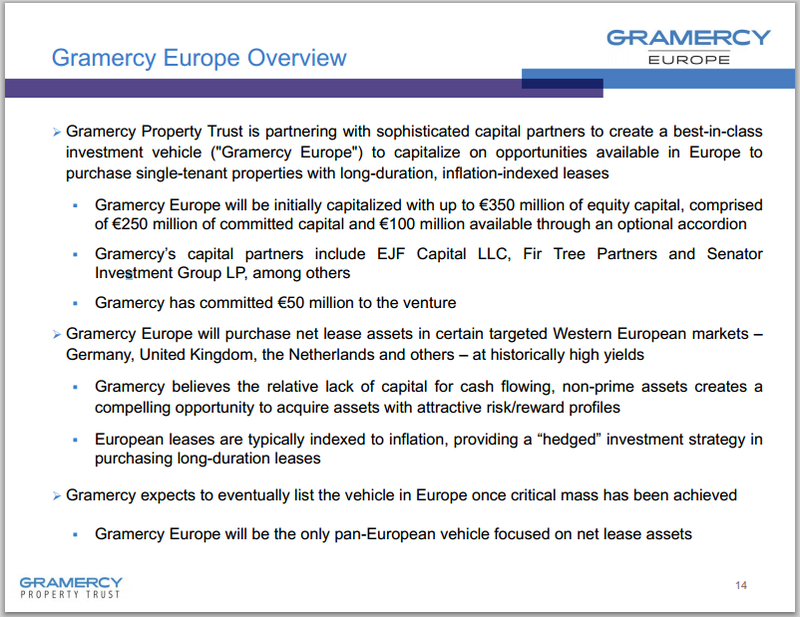 Gramercy likely doesn't hold much appeal to readers anymore, but it should, watch out for the Gramercy Europe business, it might make things more interesting this time next year especially if they decide to spinoff the overall asset management business too.